Luxurious with vivid flares. 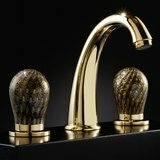 The Pert Infinity Starlight luxury vessel-sink, mesmerizing as if it were true light emanating from the stars. 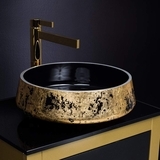 This luxury vessel-sink is absolutely graceful with its intriguing sparkle, formed like the vast galaxy and held together by gravity. The Pert Infinity Starlight has an unexplainable elegance and boundless form. 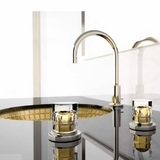 The Pert Infinity Starlight luxury contemporary vessel- sink is ideal for those who want the bold, fresh and prefer a modern design style. Made out of high tech polymer materials, enhanced with modish colors through a pearlescent finish. 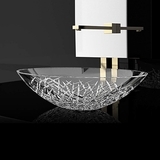 The Pert Infinity Starlight luxury vessel-sink is available in designer inspired colors: White|Starlight, Black|Starlight, Champagne|Starlight, and Blue|Green Starlight. 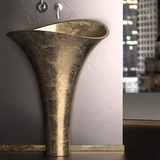 This luxury vessel- sink is infinite in its design and "in a class of its own". 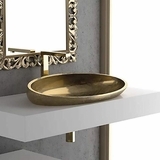 Countertop installation ensures this sink will stand out in your bathroom as a striking focal point. 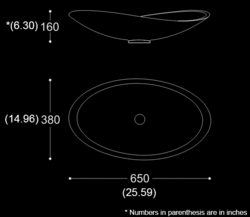 Pert is one of the most innovative and leading-edge design materials, made from a technological polymer of extraordinary quality. Pert is lightweight with a high mechanical resistance, which minimizes the need for any special maintenance. 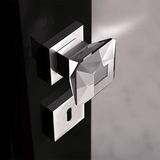 Furthermore, Pert is durable making it practical for most any design applications.